Have I gone too commerical? Last summer, overcome with more ambition than is healthy, I set up a page on my website where readers could buy books directly from me. My current platform, wordpress.com, didn’t allow this feature. So, because I am hard-wired with an abundance of optimism and scarcity of caution, I leaped onto wordpress.org. That’s a whole different and ugly blog post. Taking the next step on the path to my own destruction, I decided to offer small items – I call it swag – with my logo or the cover for my books. For instance, I think the cover for Bone Girl is a piece of artwork unto itself, so I offer a journal with the cover replicated on it. I also sell mugs and simple things like phone covers and tote bags with the Baskethound Books logo emblazoned on them, with help from Vistaprint. You are invited to peruse the shelves of Baskethound Boutique for yourself. Speaking of, how are sales? …Uh, you know, a little slow. Okay. I’ve sold a total of two books and those to my biggest fan in Alaska. Thank you, Dianne. On the Saturday she bought the books, I was working an extra shift in the urgent care clinic. Ecwid sent me an email informing me I had sold two books, and I was so overcome with joy and entrepreneurial glee that I forgot to give a patient his tetanus shot before he left. Oops. Also, I spent all of my profits on business cards and labels for Baskethound Books that very night. No sense in letting that money grow cold in my Paypal account. Who knows? It might spoil or something. Okay, so if I’m not making tens of dollars, what does this little side business give me? A sense of accomplishment? Yep. And such hope. 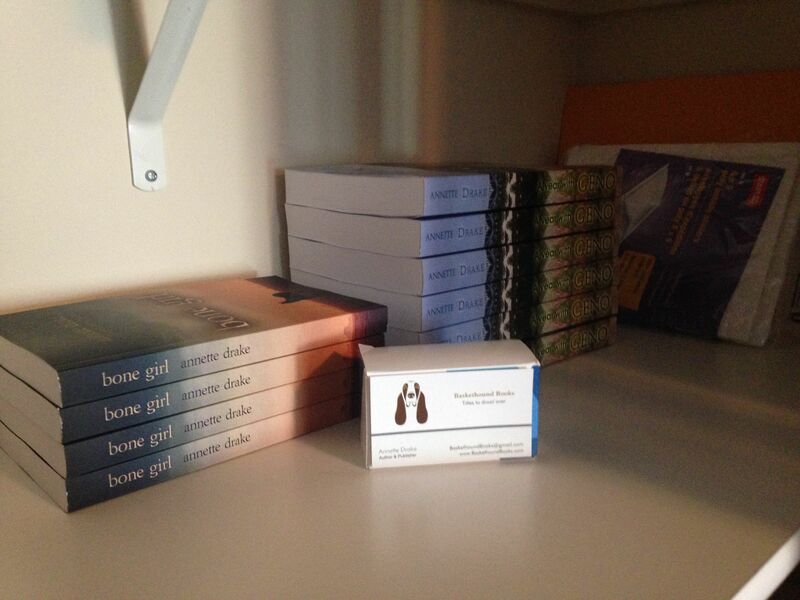 I look at the two books I have for sale now – Bone Girl and A Year with Geno – and I wonder, hmm…how many books will I publish in 2015? How about in two years? Will all three books in the Celebration House trilogy be on this shelf and ready for me to endorse and ship directly to readers? I kind of think they will. This is hope. Its value? Priceless.